In Sierra Leone, a dangerous gap remains between long-term psychosocial needs and adequate services. As youth affected by the war begin to enter adulthood, they face new challenges including unemployment, interrupted education, the need to support families, marginalization, and stigma, as well as the remaining psychological effects of exposure to war. Healthy social integration is critical to the long-term wellbeing of this generation, but the evidence base on effective interventions to improve skills and self-efficacy is severely limited. Despite the high burden of mental health problems among war-affected youth in Sub-Saharan Africa, few empirically supported behavioral treatments (ESBTs) or evidence-based interventions have been implemented in this region. Furthermore, youth in Sierra Leone struggle to successfully complete and utilize the skills learned from employment programming due to their mental health concerns and compounded adversities. This study stands to make an important contribution to knowledge on effective and culturally-sensitive mental health services that can be implemented in settings fraught by multiple hardships, including war, poverty, low educational attainment, and other hardships. 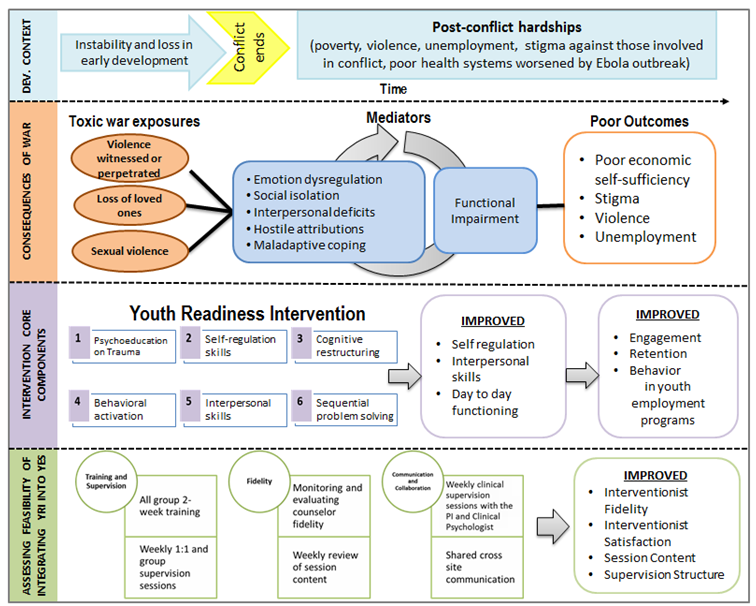 The Youth Readiness Intervention (YRI), an innovative, evidence-based mental health intervention, developed to address co-morbid difficulties with externalizing problems (anger/emotion dysregulation) and internalizing problems (hopelessness/anxiety) among youth facing adversity, was integrated into an existing youth employment scheme. The major finding of the qualitative interviews was the need increased levels of support and psychosocial interventions that target vulnerable youth, particularly within the employment sector. All 80 participants received cash transfers through a separate program and are presently involved in different employment activities. This project is funded by Grand Challenges Canada. This innovative implementation model, which scales up the YRI via youth employment programs, uses implementation research techniques to improve quality implementation. Specifically, it compared outcomes among youth participating in YRI as integrated within employment programs (YRI + EP) to a control group that participates only in employment programs (EP). By using quality improvement methodologies, the team was able to simultaneously test and establish links to employment programs. Promote the healthy integration of difficult memories for youth who experience difficulties due to traumatic exposure. During the study, the YRI was delivered by trained counselors: one male and one female bachelors-level community health worker or youth employment worker trained over a two-week period, using a manualized approach with expert oversight and input from the study leadership. The team worked with the Government of Sierra Leone (GoSL) to develop the terms of reference and expectations for sites to engage in youth employment programming consistent with the National Agenda for Prosperity. The team also established procedures for routine data collection and developed pre-test assessment batteries. The employment programming was carried out by GOAL and their partner St. George's Foundation through the use of their current grant funding. GOAL focuses on supporting people in need by providing healthcare resources, advocating and advancing child protection practices and policies, and administering livelihood programs to empower them to improve their lives in a sustainable manner. The St. George's Foundation's addresses child welfare concerns by actively reaching out to homeless and orphaned children. Their existing employment program is 4 months in length and consists of skills training, soft skills development (primarily in numeracy and literacy), and a cash transfer of $200. The employment intervention is carried out by social workers and counselors, who have been trained to support delivery of the intervention. Identification and collaboration with organizations with expertise in cash transfer employment programming, funding, and not conducting psychosocial interventions. Successful identification of youth at risk both socio-economically, but also with mental health concerns, and effective ongoing follow-up. Successful training and integration of co-facilitators from partner employment programs, and ongoing buy in from the partner organizations. Follow-up and retention of highly vulnerable youth. Coordination and collaboration of intervention delivery and supervision within the partner organization structure. This project uses an exploratory randomized controlled trial design to evaluate the impact of the intervention on the target population. Participants must not have been enrolled in school nor have gainful employment of 20 or more hours of work per week over the past four weeks. Randomization was used to assign the 80 enrolled youth to either the YRI+EP or EP alone using strata/blocking by age and gender to ensure equal distribution of these factors in both the intervention and control arm of this exploratory trial. The quantitative assessment was completed at baseline, 3-months (the post-YRI+EP interval) and 6-months following the initial interventions, and after all youth participants transitioned to employment programs. YRI implementation occurred over 3 months and youth employment activities over 6 months. Both groups (N=40 in YRI+ EP and N=40 in EP only) were assessed on attendance, workplace performance, economic self-sufficiency, financial consumption/expenditures, savings and employment-related behaviors (supervisors were interviewed about each young person blind to their group assignment) for YRI+EP youth modules from the YRI were integrated into the employment program and delivered over the course of monthly booster/check-in sessions to enhance retention of skills gained in the YRI. During the assessment period, all YRI interventionists across YRI+EP sites, as well as 8 youth, completed semi-structured qualitative interviews to elucidate the mechanisms through which the intervention proved more or less successful, in addition to providing general feedback on intervention quality and sustainability. This data was, in turn, integrated with quantitative assessments to use a mixed-methods approach to understand the feasibility of the YRI in the context of youth employment. Clinicians were evaluated in a number of ways. Each clinician completed a fidelity checklist assessment of their performance after each session, Supervisors also reviewed the audiotapes of each session and also conducted a fidelity checklist. Clinicians also completed a qualitative and quantities exit interview assessing the strengths and weaknesses of the intervention, their satisfaction, and performance. Time and salary of clinical staff, both expert and partner organization. Cash transfer amount and administrative costs. Time and cost of transport for youth. This project has been funded 270,000 CAD by Grand Challenges Canada. All 80 participants received cash transfers through a separate program and are presently involved in different employment activities. At this time, there isn't any information available on the cost-effectiveness however it will be calculated moving forward. A total of 80 youth were enrolled in the trial. Overall, the treatment and control groups were equivalent at baseline. There were an equal number of males and females, by design, who were approximately 16 years of age, had similar levels of education, and none were married at the time of the baseline survey. None of the psychosocial variables tested showed a significant difference between the YRI group and the control group. However, there were a number of trajectories detected across the entire sample, and gender differences in those trajectories. The 25-item Hopkins Symptom Checklist (HSCL) was examined, and showed a tendency for symptoms to decrease over the time of study. However, this effect was more than offset for females, whose scores increased slightly over time. This may be, in part, attributable to participants learning more about emotion identification and feeling more comfortable over time sharing those feelings in the interview. Several outcomes were measured using the Oxford Measure of Psychological Adjustment (OMPA) scales. The OMPA total problems score increased significantly over time for females. The OMPA internalizing scale showed an increase over time for females, with no statistically significant effect for males. The OMPA externalizing scale also showed an increase in symptoms over time for females without a significant offsetting trend for males, although the magnitude is close to half the trend for females. There were no significant trends over time for the OMPA prosocial or confidence scales. As with the HSCL this may be attributable to participants being able to assess, identify, and speak about their behaviors and emotions. This will need to be examined more fully in our powered trials, as the study is ultimately underpowered; thus small variations in scores have the ability to skew data in a direction that may be misleading. Emotion regulation showed an increase over the period, which is nearly exactly offset for females. Irritability showed an average monthly decrease. The WHODAS manifested a monthly decrease, but with a perfectly offsetting effect for females, who manifested no average monthly change. The major finding of the qualitative interviews was the need increased levels of support and psychosocial interventions that target vulnerable youth, particularly within the employment sector. Specifically, youth reported that they struggled interacting with others. Facilitators, NGO, multilateral, and government stakeholders reported that youth often struggled to successfully complete programming, but that the intervention resulted in a major change in the youth overall. While we did cultivate strong buy in, stakeholders did not fully understand the nature of evidence based psychosocial interventions prior to the intervention. Data suggests that this intervention was effective and well received by all stakeholders. Many commented that the intervention was a missing link for employment program effectiveness. At the programmatic level, youth and facilitator interviews focused on intervention expectations, experiences, and impact. At the stakeholder level, interviews with individuals within government, multilateral, and non-governmental organizations focused on overall employment program needs and effectiveness, efficacy of targeting, and the addition and integration of psychosocial services into employment programming. Facilitators and youth both spoke of the impact of the intervention. Facilitators cited specific examples where they saw noticeable change and recounted stories the youth had told them as part of their homework and about their lives. Youth reported being able to achieve or make significant progress towards their goals that often included mending strained or broken relationships and their image in the community, and improving interactions with others. Addressing the Consequences of Violence and Adversity in "From Research to Practice in Child and Adolescent Mental Health"